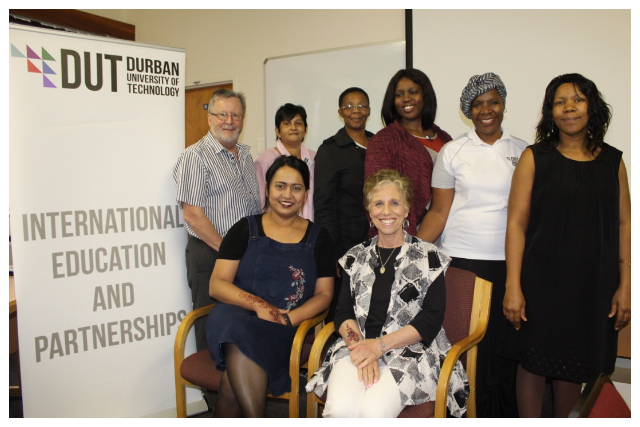 The Directorate of International Education and Partnerships of the Durban University of Technology (DUT) hosted a 1-day Collaborative Online International Learning (COIL) staff development workshop, under the theme, “Are you ready and willing to Coil” on 31 May 2018 at the Riverside Campus, in Pietermaritzburg. The aim of this hands on and interactive workshop was to introduce to DUT the COIL concept and to provide practical tools for the implementation of the COIL project. It was facilitated by Professor Krista Rodriguez, who is a visiting Professor from the Monroe Community College (MCC) from USA, and has been using COIL since 2015. She was facilitating jointly with DUT’s Senior Lecturer in the Department of Dental Sciences, Dr Anisa Vahed. Dr Vahed who started using COIL in 2016, said she was enticed by COIL due to the strong call within DUT for incorporating eLearning into teaching and learning. She added that COIL is built on the premise of team teaching, language skills development, intercultural competence and technology. “My second COIL partner is a Business Administrator, and we’ve worked out an arrangement that his students will assist my students with the marketing, advertising and promotions element of their business plan projects. This was after I picked up a gap in this area from their assignments,” said Dr Vahed. She said she believes that the successful implementation of the COIL project at DUT is heavily dependent on collaborative efforts from all internal stakeholders. Prof Rodriguez said she was happy to impart her knowledge about COIL, and she was inspired by the enthusiasm from all the participants. “They are asking so many questions about how they can implement COIL in their respective programme, which shows that they want to learn. I also like the cultural exchange that is taking place through COIL,” she said. “COIL allows you to be creative, and that’s why it is important to always think out of the box when you are choosing partners,” she added. COIL was developed by the State University of New York (SUNY) as a cost effective global learning network. Pictured: Professor Krista Rodriguez and Dr Anisa Vahed (seated), with some of the DUT staff members who attended the workshop.